For the Gazette/Jon Jaehnig NoveList, a subscription-based online database, connects readers with book suggestions based on their book preferences and has resources for parents and teachers. 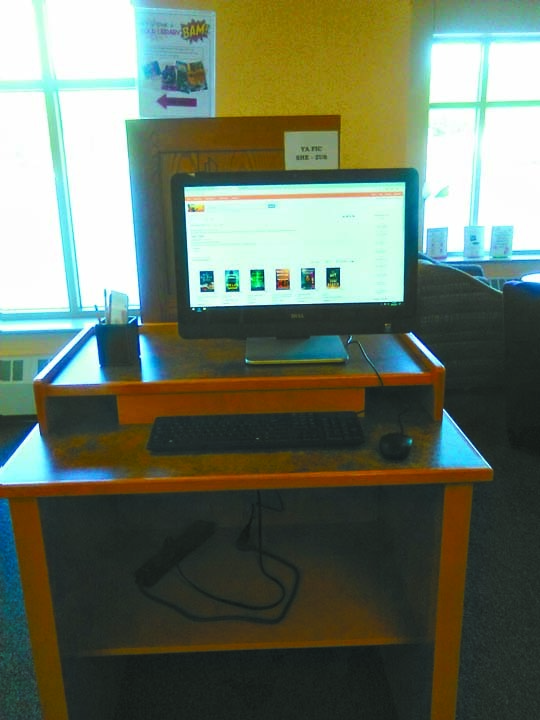 The Portage Lake District Library offers this service and teaches people how to use it on a computer located inside the library (pictured above). HOUGHTON — Even the most avid readers — especially the most avid readers — can have trouble finding the next book to read. That is why the Portage Lake District Library offers an online service available to its cardholders anywhere and anytime to help connect readers to their next read. The library started using the service, called NoveList, at the beginning of this year, and ever since it has been popular with patrons as well as with staff. “Some of the younger [people] that volunteer at the front desk use it to suggest books to patrons,” said Dillon Geshel, Director of the Portage Lake District Library. “We use it on the back end quite a bit as well,” said Geshel. NoveList is a powerful database, and such tools don’t come cheaply. Fortunately, the library pays for the subscription but makes it available to the general public. To find it, just go to the library’s website, pldl.org, find the “Resources A to Z” tab, and select “N.” Here you will find a link to the standard NoveList page, as well as NoveList K-8, a version just for children. To access NoveList from a home computer, you will need to enter the pin on your library card. You don’t have to be a member to use NoveList at the library, but you will need to be a member if you want to check out any books that you find. If that was too much for you, stop in at the library where staff are ready to walk you through finding NoveList, as well as its many tools and resources. “The time that it takes to show people how to use it depends on how comfortable people are browsing the web. On the face of it, it’s pretty simple,” said Geshel. Before you select any tool or input any information, NoveList suggests titles, but don’t worry if these aren’t to your liking. They’re just the featured books for the month. To find a more personal selection, select “Try the Appeal Mixer” near the top of the web page. “This is what NoveList is most proud of in terms of how they recommend titles,” said Geshel. The appeal mixer allows you to choose up to three characteristics that you look for in a book. The list includes things like the tone of the book, its sense of atmosphere, its illustrations or whether it is primarily character-driven. Once you’ve chosen the characteristics that matter to you, you can choose how you like those characteristics. If you like a character-driven book you can choose to see books about troubled characters. If you like books with a certain atmosphere you can choose to see books with a dark atmosphere. NoveList also has a search feature that lets you search by title, author, or key word. Searching by keyword allows you to easily explore your interests, but searching by title or author can be just as helpful. NoveList suggests “read-alike” authors and titles, so finding a book or author that you already know that you enjoy is a great way to discover similar content. If you find a book that you are interested in and that the library has available, you can pull up the book’s call number, have its location texted to your phone or have the staff reserve the book for you, all from the NoveList page. If the library doesn’t have a book that you are interested in, it can be requested through interlibrary loan. NoveList is a great source for librarians and casual readers but it is also a great source for teachers. The site makes discussion guides updated every month with new novels, as well as discussion guides for older books. The “Picture Books Extender” is a similar tool for books for young children. The site also generates book lists based on genre and age of the reader. For more information on using NoveList, or to track down books that it recommended to you, email info@pldl.org, call 482-4570, or visit the Portage Lake District Library at 58 Huron St. in Houghton. Operating hours are 10 a.m. to 8 p.m. on Monday through Thursday, 10 a.m. to 5 p.m. on Friday, and 10 a.m. to 3 p.m. on Saturday.